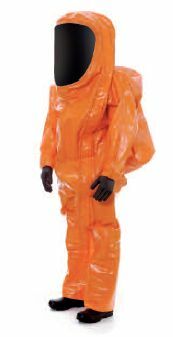 The Drager CPS 5900 is a gas-tight chemical protective suit, which is perfect for hazmat incidents and is completely disposable. This lightweight suit gives complete protection against hazardous liquids, gases and particles. This new Drager suit offers outstanding protection from a vast range of hazardous chemicals and welfare agents. The Drager CPS 5900 has been specially produced for low risk tasks, such as measuring or transferring hazardous materials in non-explosive atmospheres. As the first chemical protective suit to be approved to NFPA 1994, class2 and EN 943 part 1&2 (ET), it also fulfils the requirements of the SOLAS convention. As a result, it has achieved the highest international standards of fire fighters and industrial users for limited use, gas-tight protective suits. For heavy duty tasks which carry the risk of flash fire or mechanical stress, the Drager CPS 7900 would be much more adequate. The Drager CPS 5900 is compatible with the latest breathing/safety equipment and many other types of personal protection apparatus, whilst also offering enhanced ergonomics. The suit can also be worn with twin cylinders or closed circuit breathing equipment. It is designed to fit male and female users between the sizes of 1.50m and 2.10m in height. The suit is available in 5 different sizes and is made from Zytron 500, the laminate material which is said to be the softest around. The CPS 5900 has also been hot-air taped both inside and out along the seams of the suit and has an estimated 10 year shelf life because of its high quality production and materials.